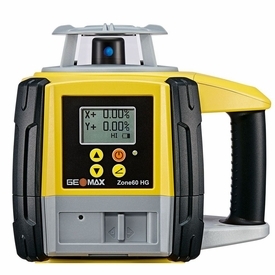 GeoMax Dual Slope Zone60 HG. Semi Automatic Dial In Dual Slope Rotating Laser with ZRP105 Pro Receiver Adding easy-to-use, dial-in grade capability to the dependability of the Zone40 H core, this laser is more flexible in use and enables semi-automatic grade in levelling applications. 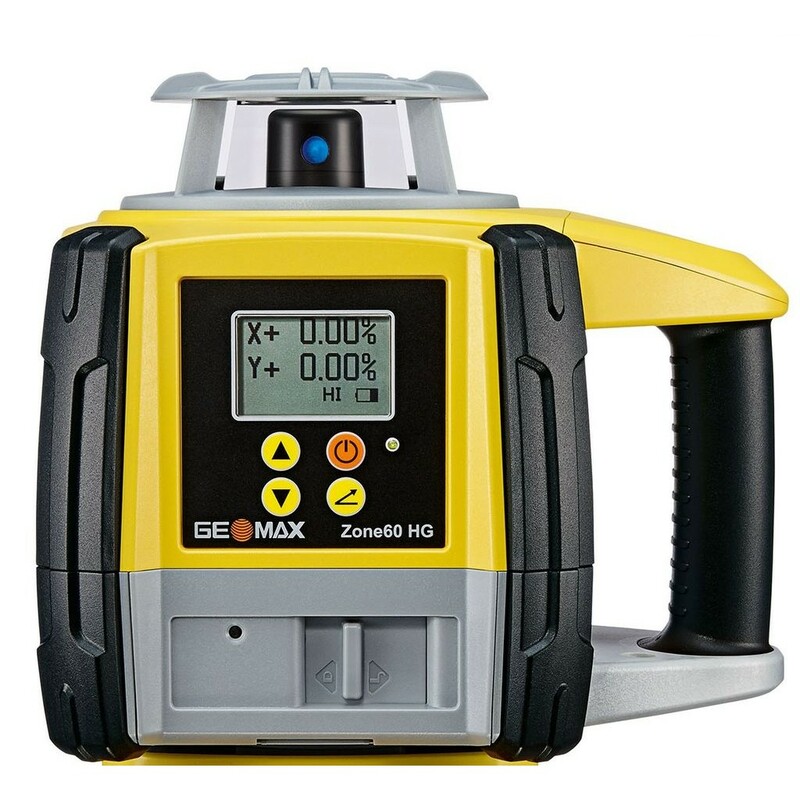 The AGL GEOMAX ZONE 60 HG adds easy to use, dial in grade capability to the dependability of the Zone 40 H core. This laser is more flexible to use and enables semi-automatic grade in levelling applications. The laser is a visible beam laser. It is self-levelling in the horizontal plane & digital slope in dual axis (semi-automatic). Specification Functonality: Self-levelling horizontal & digital slope in dual axis (semi-automatic) Head Protection: Fully enclosed Operating Range: 900 metre / 3000 feet diameter Self-levelling Accuracy: +/- 1.5mm at 30m (+/- 1/16" at 100 feet) Self levelling Range: +/- 6 degrees Grade Range: 8% Rotation Speed: 600 rpm Laser Diode Type / Class: 635 nm (visible) / Class 1 Batteries: 4 D-cell alkaline / Battery Life: > 40 hours Operating Temperature: -20 degrees C to 50 degrees C Storage Temperature: -30 degrees C to 70 degrees C Environmental Standard: IP67 rated Package Includes GeoMax ZRP105 Pro Receiver 835247.